Status quo is not a viable strategy. Banks with high LTD ratios must do something, or they will be forced to sell loans for a fraction of their earnings potential, have no capacity to book new loans, or lean on far-more expensive sources of wholesale funding. Those strategies not only crimp profits, but are unsustainable and represent nothing more than a short-term Band-Aid. Organic growth is not a practical option. Opening or investing in a new branch is futile, plus it takes far too long to have an impact. This is especially true in an environment and footprint where the deposit pie is flat or shrinking. Banks can only grow deposits organically by taking market share away from someone else. This means more hand-to-hand combat, and ultimately a price war. Tax reform as an off-set will also have a short-shelf life. Many banks are taking a false sense of comfort by reconciling the squeeze on the net interest margin with a massive reduction in tax expenses. While this is true on a per-dollar basis, the problem with this thinking is that EVERYBODY benefits from tax reform, not just your bank. And if everyone’s ROE increases, then investors’ expectations for ROE increase—it gets baked into the norm. In turn, this will result in an increase in the cost of capital, and suddenly a 10 percent ROE will no longer be good enough. We will be back to the days where 15 percent ROE is the hurdle rate. 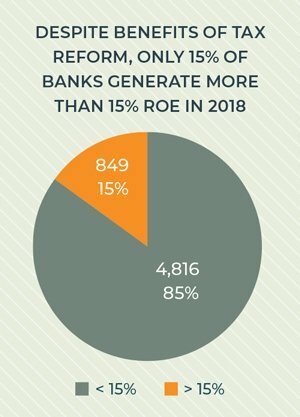 This will put a lot of pressure on banks that are not at this level of performance even after recognizing the benefits of tax reform. The climate may get worse before it gets better. 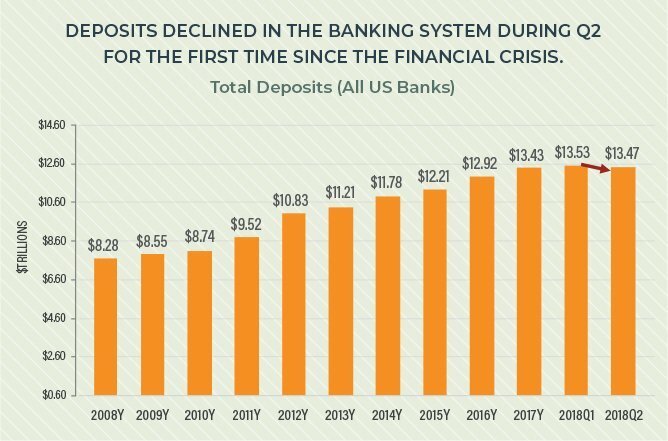 We might be in the very beginning of this banking economic environment. Core inflation is rising, which will pressure the Fed to become even more hawkish on short-term rates. The consequences of QE reversal are unknown, but it is possible that it may cause a significant deposit shortage and dislocation. This would exacerbate the pressure on NIMs and potentially create liquidity challenges. While nobody knows exactly what will happen, banks must have a contingency plan in place for such a scenario. 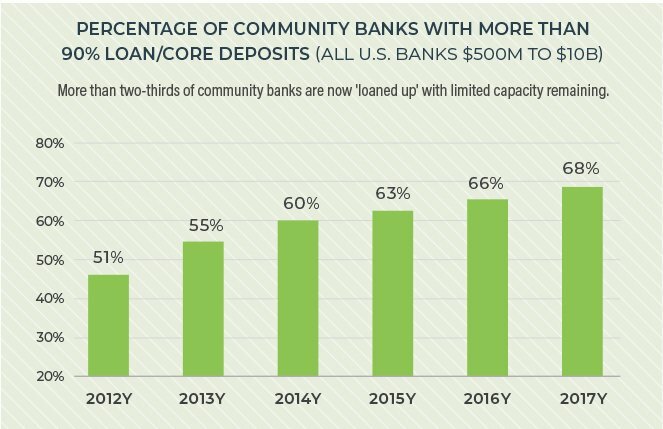 In fact, a deposit shortage in the banking industry is a far more of a practical threat to community banks right now than another 2008-style crisis. Consolidation is likely to accelerate. These issues will make community banks with high LTD ratios more vulnerable to becoming an acquisition target. Due to the constraints that lack of deposits have on loan growth, the case for maximizing shareholder value by selling the bank increases by default because the stand-alone case is trending downward. This strategy will significantly increase the number of viable targets and create significant financial value for the acquirer because it solves a financial problem (deposit growth). There is also strategic value in these acquisitions. Banks should think of these type of acquisitions as acquiring a ‘deposit production office’ or “DPO”. Those deposits, which tend to be very sticky, can then be loaned out in the bank’s core growth markets, essentially optimizing its role as a financial intermediary. the opportunity to retain the target’s key leadership and even rank-and-file employees since they understand the market and customers. However, the need to retain more personnel and the absence of branch overlap (that’s the point of the acquisition) also means there is less opportunity for cost synergies. In addition, many of these banks will demand valuations that might appear ‘excessive’ if they are enticed to sell. Those banks lucky enough to have a fungible equity currency trading at an attractive multiple can solve this challenge, but banks with out-of-balance LTD ratios are also less likely to be in that situation. They must use more cash or a weaker equity currency to fund the transaction. Conventional techniques such as EPS accretion and TBV dilution analysis cannot properly measure the impact of these transactions on shareholder value. One problem: Banks are not honest with themselves when analyzing the baseline scenario of status quo. They often make rosy, unrealistic assumptions about loan growth, deposit growth, loan yields, and cost of funds—assumptions that do not reflect the reality of the environment. This sets the bar way too high for any realistic evaluation, leading to lower EPS accretion, greater TBV dilution, and a slower payback period. Different analytics are required to properly value the balance sheet components of a prospective acquisition. The valuation of a target’s deposits must capture the ability to replicate such deposits with organic growth (which is just about impossible in this environment as previously mentioned), the increase in capacity and resulting impact on profitability to preserve or make loans with those deposits; and the downside protection the target’s deposits provide against a deposit drain caused by QE reversal. Management teams must begin educating directors and shareholders on these challenges. Management teams will need to prepare and preempt resistance because this strategy is counter-intuitive. If the case is laid out properly, the vast majority of directors and shareholders will recognize how these types of acquisitions can ultimately maximize shareholder value. For those that still object, at least the CEO has fulfilled his or her fiduciary duty. It is vital to note that this unconventional strategy requires a first-mover advantage. A handful of banks in growth markets are already pursuing this strategy, but it is in its infancy. In six months to a year, however, expect more banks to follow suit, and there will be a mad rush to the proverbial rural door. But by then, it will be too late as those low LTD ratio banks willing to sell will have already been picked off. Waiting until the ‘big fish’ in your market announces an out-of-market acquisition to make it easier for you to pursue such a strategy is a mistake. This is where the CEO’s courage and leadership come in. 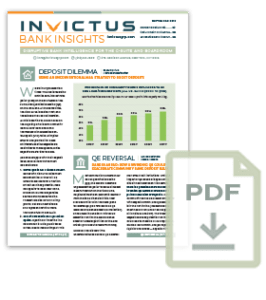 Editor’s Note: Invictus Group has developed a service for banks in this situation that would like to explore both in-market and out-of-market acquisition opportunities. This service will provide management with a process for identifying, properly analyzing, and closing transactions which will alleviate the deposit problem. For more information, please contact George Callas, Chief Revenue Officer, at gcallas@invictusgrp.com.